MINNEAPOLIS (Gray News) - Virginia overcame a Texas Tech comeback in the second half and outlasted the Red Raiders in overtime to capture their first national men’s basketball championship Monday, with a 85-77 victory in Minneapolis. It was an unprecedented turnaround for the Cavaliers, who became the first 1-seed to be upset by a 16-seed just a year prior, when they infamously bowed out in the first round to the University of Maryland-Baltimore County. DeAndre Hunter hit two critical threes with the Cavaliers on their heels late, one in regulation and one again in overtime, and his 27 points led the team. Star guard Kyle Guy had 24. “We came in together and said that we’re going to win a national championship, and to be able to hug each other with confetti going everywhere is the greatest feeling I’ve ever felt in basketball," Guy said. Brandone Francis led the Red Raiders with 17. 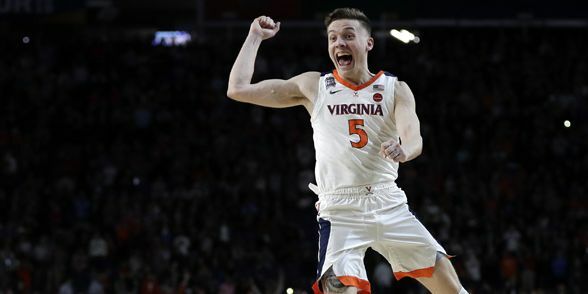 Hunter nailed a three-point jumper to put Virginia up two with just over two minutes to go in overtime, spurring Virginia ahead for good. Ty Jerome drew a foul on a driving runner with about 40 seconds to go and nailed both free-throws, extending the Virginia lead to four. From there, Texas Tech - who had played from behind most of the night - couldn’t mount one more scramble back. Francis attempted a three in response from the corner, but caught the front of the rim. Free throws from there sealed it for the Cavaliers. Matt Mooney had hit a pair of shots to score five points to open the extra period for Texas Tech, giving the Red Raiders a brief three-point lead with about three minutes left. The defensive-minded teams found their offensive flow at the end of the second half, trading a handful of buckets in the final minutes. Facing a pressure-packed 1-and-1, Norense Odiase made both free-throw attempts to give Texas Tech a three-point lead with 20 seconds to go in regulation. But Virginia’s Hunter hit a clutch game-tying three on the other end of the court 10 seconds later. A last-second attempt by Texas Tech’s Jarrett Culver was blocked. The Red Raiders first went ahead on Culver’s driving layup with 35 seconds to go. The Cavaliers had held a lead as large as eight midway through the second half. Both schools were going for their first national titles backed by their hard-nosed defenses that were among the best in the nation. The result gives the NCAA Tournament its first first-time champion since coach Billy Donovan won it all with Florida in 2006. Virginia had lost its previous two trips to the Final Four, in 1981 and 1984. Texas Tech reached the Elite Eight for the first time last season. The last time two teams who had never won a championship played in the title game was Michigan State against Indiana State in 1979. That’s right, Magic Johnson vs. Larry Bird. Magic’s Spartans won that game. Not bad company for Hunter, Guy and the Cavaliers.